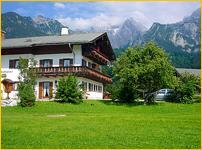 Our holiday farm lies in perfect position between Bischofswiesen and Berchtesgaden. 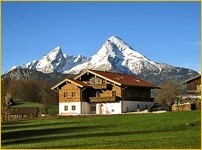 A well-known hiking-journal described our property as "Das Alpenidyll schlechthin" ("the truly rural alpine idylle"). 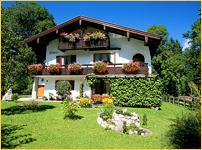 Our holiday apartments in cosy, Bavarian style are comfortably furnished, so that you are eager to return. The children enjoy the lawn and all the playing equipment. There is a lot to see! 4 holiday apartments for 2-4 people, 35-85 qm, from 55 Euro. The apartment, which is furnished in country-style, is suitable for 2 people. Attached to the guesthouse "Anemone" it still has its own entrance. As the apartment is located in a very calm area within the ristrict Hinterschönau, it is the perfect place for your recreation. Both, lawn for sunbathing, as well as a covered terrace belong to the appartment. Our ****non-smoking holiday home (150qm) is stylishly decorated and magnificantly equipped with three separate bedrooms, three toilettes, one bathroom with shower, a kitchen with dishwasher, microwave and barbecue. 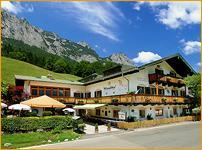 It lies offside the road surrounded by fields and offers you a marvellous view over the mountains of Berchtesgaden. Our house lies above Berchtesgaden and the district Oberau, at the Roßfeld-Höhenringstraße in 800 m heights, in the midst of a wonderful landscape. Bright and friendly ***guest rooms with balcony or terrace and shower/WC are awaiting you, as well as generously furnished *****holiday apartments.